I absolutely love working with couples and capturing their love in a romantic and beautiful display of images. 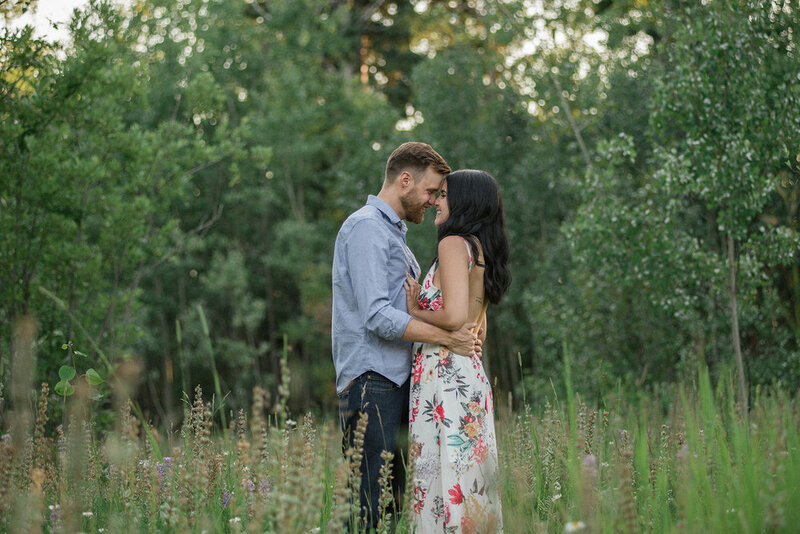 Engagement sessions or just a session with your love are fun because you can personalize it to make it all about you two. We can do many things to personalize a session for you, such as: pick a location that has meaning to you and choosing a great outfit. My favorite locations are rivers, mountains, and fields. I personally prefer natural and uncluttered backgrounds, and I love unique sessions (see blog post on session ideas here). Think about what you would wear for a date night or a nice evening out. Long flowy maxi dresses photograph really well and are my favorite article of clothing for ladies to wear at a session! Your pictures should represent you and your lifestyle. Black and white clothes are always a classic, but do not be afraid to wear a pop of color! Light colors are the most flattering and highly recommended. (Pinteresting 'engagement photography' is a wonderful way to get inspiration on what colors look great). Coordinate your colors, but try not to be too matchy, matchy. To simplify it, pick a color pallet, and create your outfits from that. Keep in mind what season we are shooting in, and dress accordingly. Also keep in mind the setting that we are shooting in. For example, if we will be in a heavily trees area, earthy colors will look amazing. If we are going to be in a more industrial setting, bolder colors will stand out well. Bring a change of clothes or shoes if we are in for a walk or hike to get to where we want to take the photos. It is ok to bring multiple outfits even if we don't get to them, it is fantastic to have different options. Wearing clothes with patterns can be flattering, but please do not go overboard. Skipping neon colors is a great idea if you want your photos to look timeless. Hawaiian shirts and cargo pants have a time and a place, a photo shoot is not one of them! Please do not wear sweatpants, athletic wear, or pajamas. For shoes, please try and skip the running shoes. Please, please try and avoid tan lines or crazy fake and bake tanning. We have many guys in this town who wear hats on a regular basis but the DO NOT photograph well. Most of them will leave a dark shadow on your face and over your eyes. Please leave the ball caps at home! Accessories are great! Feel free to bring necklaces, earrings, bracelets, hair accessories, scarves and/or a hat. Please remove hair ties from your wrist at least 2 hours before our session so that we do not have marks on your skin. If you have an inspiration board on Pinterest or a spread from a magazine, please bring it so that I can see your ideas. I recommend making sure that you have eaten before our session so that your are freshly energized and no one becomes hangry! If you need to bring drinks and snacks, please feel free. Being on time is extremely important so that we can utilize the time that we have together. If you have any questions at all through the process please do not hesitate to call me or message me. Pick an outfit and want an opinion? Snap a photo with your phone and send it over!